Awwwwwwwwww Kranky, cue drooling, and unfocused rambling and babbling when it comes to my reasoning of how good this label has been since its inception. 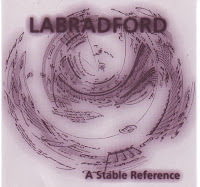 Labradford have to be one of their flagship bands, releasing all of their best material on the label (although their releases on other labels are also excellent) of which 'A Stable Reference,' stands as their definitive creation. Accurately pinning down Labradford's sound has always been part of their appeal, not quite post rock, not quite indie and not quite shoegaze but rather a meeting and implementation of the three. Thus creating an alluring, intoxicating soundscape of ethereal beauty that is dangerously addictive and has sometimes left me (especially on days where I have been confined to spending them in bed) to playing the record constantly for several hours. Yet, their approach and methodology is so simple but so effective, while the cliched saying of 'less is more,' is often a petty euphemism that the artist has decided to water down their music, here the phrase is applicable. Guitars move solmenly and slowly like the thick fog that engulfs London, vocals occasionally ghost through the fog and seldomly a beat of some sort will emerge to provide a rhythmic backbone. This one is still readily avaliable from http://www.amazon.com/Stable-Reference-Labradford/dp/B000008PKY/sr=1-6/qid=1172013929/ref=sr_1_6/104-4492477-3459918?ie=UTF8&s=music both new and used. You are a man of taste and discernment. Labradford are the flagship of the kranky fleet, the band the label was set up around. Personally, I prefer the third, self-titled album but they're all good and no two are alike. Readers looking to purchase copies should go to kranky.net. Thank you sir, most kind, it was a hard choice for me in choosing a Labradford record, but of all of them, this is the one I have always come back to, but as you say the self titled is quite exquisite!! Again, look out for stuff in the future and thanks again for your feedback! !